Lord Rama (center) with wife Sita, brother Lakshmana and devotee Hanuman. Rama and Lakshmana are always shown to be ready for battle (with bow and arrow) as it is their Kshatriya dharma to fight. Rama is shown having blue skin which is a characteristic of Vishnu. In Hinduism, the Rāmāyaṇa is an ancient Sanskrit epic attributed to the poet Valmiki and is an important part of the Hindu canon (smṛti). The name Rāmāyaṇa is a compound of Rāma (the hero of the Epic) and ayana (meaning "going, advancing"), thus translating to "the travels of Rāma." The Rāmāyaṇa consists of 24,000 verses in seven cantos (kāṇḍas) and tells the story of a prince, Rama of Ayodhya, whose wife Sita is abducted by the demon king of Lanka, Rāvana. In its current form, the Valmiki Ramayana is dated variously from 500 B.C.E. to 100 B.C.E., or concurrent to early versions of the Mahabhārata. As with most traditional epics, it has gone through a long process of redactions and is impossible to date accurately. One of the most important literary works on ancient India, the Ramayana has had a profound impact on the devotion, art and culture in the Indian Subcontinent. The Rāmāyana also had an important influence on later Sanskrit poetry, primarily through its establishment of the Sloka meter. Like its epic cousin the Mahābhārata, the Rāmāyana is not just an ordinary story. It contains the teachings of ancient Hindu sages and presents them through allegory in narrative form. The characters of Rama, Sita, Lakshmana, Bharata, Hanumān and Rāvana (the villain of the piece) are all fundamental to the cultural consciousness of India. The story of Rama also inspired a large amount of later-day literature in various languages, notable among which are the works of the sixteenth century Hindi poet Tulsidas and the Tamil poet Kambar of the thirteenth century. The impact of the Ramayana has also spread beyond India. Starting from the eighth century, the colonization of Southeast Asia by Indians began. Several large empires like the Khmer, the Majapahits, the Sailendras, the Champas and Sri Vijaya were established. As a result of this, the Ramayana became popular in Southeast Asia and manifested itself in text, temple architecture and performance, particularly in Indonesia (Java, Sumatra and Borneo), Thailand, Cambodia, Malaysia, Vietnam and Laos. Valmiki's Ramayana, the oldest and most widely read version of Ramayana. The text survives in numerous complete and partial manuscripts, the oldest surviving of which is dated from the eleventh century C.E.. The Valmiki Ramayana has been traditionally divided into seven books, dealing with the life of Rama from his birth to his death. Bala Kanda – Book of the young Rama which details the miraculous birth of Rama, his early life in Ayodhya, his slaying of the demons of the forest at the request of Vishvamitra and his wedding with Sita. Ayodhya Kanda – Book of Ayodhya in which Dasharatha comes to grief over his promise to Kaikeyi and the start of Rama's exile. Aranya Kanda – Book of the Forest which describes Rama's life in the forest and the abduction of Sita by Ravana. Kishkinda Kanda – Book of Kishkinda, the Vanara kingdom in which Rama befriends Sugriva and the Vanara army and begins the search for Sita. Sundara Kanda – Book of Sundara (Hanuman) in which Hanuman travels to Lanka and finds Sita imprisoned there and brings back the good news to Rama. Yuddha Kanda – Book of the War, which narrates the Rama-Ravana war and the return of the successful Rama to Ayodhya and his coronation. Uttara Kanda – Epilogue, which details the life of Rama and Sita after their return to Ayodhya, Sita's banishment and the eventual demise of Sita and Rama. There have been speculations on whether the first and the last chapters of Valmiki's Ramayana were indeed written by the original author. Many experts are of the opinion that in spite of the many differences in style, and occasional contradictions in content, between these two chapters and the rest of the book, the chapters are still an integral part of the story. These two chapters contain most of the mythological interpolations found in the Ramayana, such as the miraculous birth of Rama and his divine nature as well as the numerous legends surrounding Ravana. Rama is the hero of this epic tale. He is portrayed as an incarnation of the god Vishnu. He is the eldest and the favorite son of the King of Ayodhya, Dasharatha. He is a popular prince loved by one and all. He is the epitome of virtue. Dasaratha, forced by one of his wives Kaikeyi commands Rama to relinquish his right to the throne and go into exile by his father. While in exile, Rama kills the demon king Ravana. Sita is the wife of Rama and the daughter of king Janaka. Sita is the epitome of purity and virtue. She follows her husband into exile and there gets abducted by Ravana. She is imprisoned in the island of Lanka by Ravana. 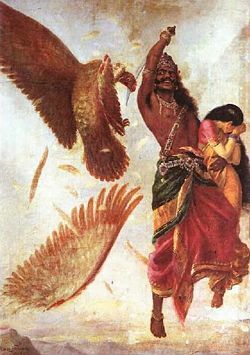 Rama rescues her by defeating the demon king Ravana. 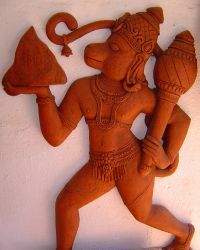 Hanuman is a monkey (Vanara) belonging to the monkey kingdom of Kishkinda. He worships Rama and helps find Sita by going to the kingdom of Lanka crossing the great ocean. Lakshmana, the younger brother of Rama, chose to go into exile with him. He spends his time protecting Sita and Rama. He is deceived by Ravana and Maricha into believing that Rama was in trouble while Sita gets abducted. Ravana is a demon who is the king of Lanka. He received a boon from Brahma that he will not be killed by either gods, demons or by spirits, after performing a severe penance for ten thousand years. He has ten heads and twenty arms. After getting his reward from Brahma, Ravana begins to lay waste the earth and disturbs the deeds of good Brahmins. Rama is born a human to defeat him, thus overcoming the boon given by Brahma. Dasharatha is the king of Ayodhya and the father of Rama. He has three queens, Kousalya, Sumitra and Kaikeyi, and three other sons, Bharata, Lakshmana and Shatrughna Kaikeyi, Dasharatha's favorite queen forces him to make his son Bharata heir apparent and send Rama into exile. 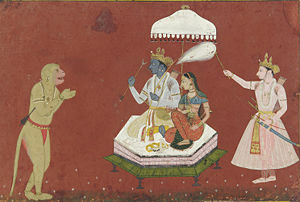 Dashatara dies heartbroken after Rama goes into exile. Bharata is the second son of Dasharata. When he learns that his mother Kaikeyi had forced Rama into exile and caused Dasharata to die broken hearted, he storms out of the palace and goes in search of Rama. When Rama refuses to break his exile to return to the capital to assume the throne, he requests and gets Rama's sandals and places them on the throne. Vishwamitra is the sage who takes Rama into the forest at the behest of defeating the demons destroying his Vedic sacrifices. On the way back he takes Rama into Mithila where Rama sees and falls in love with Sita. Rama, the hero of Ramayana, is a popular deity worshiped by Hindus; the route of his wanderings being, each year, trodden by devout pilgrims. The poem is not a mere literary monument, it is a part of Hinduism, and is held in such reverence that the mere reading or hearing of it, or certain passages of it, is believed by the Hindus to free them from sin and grant every desire to the reader or hearer. According to Hindu tradition, Rama is an incarnation (Avatar), of the god Vishnu, who is part of the Hindu Trinity. The main purpose of this incarnation is to demonstrate the righteous path (dharma) for the life on earth. Brahma, creator of the universe, could not revoke a boon he gave the demon king Ravana, as a reward for his severe penances, that he should not be slain by gods, demons, or spirits. Having been thus rewarded, Ravana began with the help of his evil supporters, the Rakshasas, to lay waste the earth and to do violence to the good, especially the Brahmin priests, disturbing their sacrifices. All the gods, watching this devastation, went to Brahma to find a way to deliver themselves and the earth of this evil. Brahma went to Vishnu and conveyed the anguish of the gods and requested that Vishnu incarnate on earth as a human to destroy Ravana, as Ravana had not asked for protection against humans or beasts in his wishes to Brahma. Meanwhile, the good king Dasharatha of Ayodhya, who had ruled over his kingdom of Kosala for a long time, was beginning to become anxious about his successor, for he had no sons to take over the kingdom after him. Taking advice from his ministers and priests Dasharatha organized a Putrakameshti Yagna, a sacrifice for progeny. Vishnu decided to be born as the eldest to Dasharatha and caused a divine being to emerge from the sacrificial fire. The divine being gave Dasharatha a golden vessel filled with nectar and asked him to give it to his queens. Dasharatha divided it amongst his three queens, Kausalya, Sumitra and Kaikeyi. In due course they became pregnant and gave birth to four sons: Queen Kausalya gives birth to the eldest son, Rama. Bharata is born to Queen Kaikeyi, and twins, Lakshmana and Shatrughna, are born to Queen Sumitra. The boys grew up learning the scriptures and the art of bowmanship from the sage Vasishta. One day, the sage Vishwamitra visited the kingdom and asked King Dasharatha to send Rama to protect him from demons who had been disturbing his sacrifices. Although very reluctant, Dasharatha agreed to send Rama and Lakshmana with Vishwamitra. As the brothers fulfilled their duties, Vishwamitra was pleased with them and bestowed upon them various celestial weapons. Towards the end of their stay with Vishwamitra, Rama chanced to pass near the kingdom of Mithila and heard that its king, Janaka, had offered his daughter, Sita, in marriage to the man who could bend the mighty bow of god Siva, which had been kept at Janaka's court. Rama at once determined to accomplish the feat, which had been tried in vain by so many suitors. When he presented himself at court Janaka was at once won by his youth and beauty. Five thousand men drew in the mighty bow, resting upon an eight-wheeled chariot. Rama without any apparent effort bent it until it broke and, Janaka gladly gave him his beautiful daughter. After the splendid wedding ceremonies were over, the happy pair travelled back to Ayodhya. King Dasharatha, began to feel weary of reigning, and decided to make Rama, his eldest son and heir-apparent, the co-regent (Yuvaraja). His happy people received the announcement of his intention with delight and the whole city was in the midst of the most splendid preparations for the ceremony. Dasharatha went to discuss the celebrations with his favorite wife Kaikeyi. However, Kaikeyi was jealous because her darling son Bharata was not to be made co-regent, so she fled to an ante-chamber where Dasharatha found her in tears. To Dasharatha's concerned queries, Kaikeyi recalled that, ages ago, the old king had granted her two boons. She now demanded the fulfillment of these before she would consent to smile upon him. Dasharatha agreed and Kaikeyi revealed her demands. She required him, first, to appoint her son Bharata as co-regent and, second, to exile Rama for 14h years to the terrible forest of Dandaka. Dasharatha was grief-stricken, but agreed to abide by his promise. Rama, the obedient son, immediately agreed to relinquish his claim to the throne and started to leave for his exile. His faithful wife Sita and his loving brother Lakshmana also decided to go along with Rama. With Dasharatha lying grief-stricken, Rama left for the forest, followed by the lamenting people of Ayodhya. Soon after, King Dasharatha died, overcome by grief. Rama, Sita and Lakshmana left behind Ayodhya and its people, crossed the river Ganges and went into the forest. They found an idyllic place called Chitrakuta to establish their hermitage. No more beautiful place could be imagined. Flowers of every kind, delicious fruits, and on every side the most pleasing prospects, together with perfect love, made their hermitage a paradise on earth. In the forest, Rama befriended the old vulture-king, Jatayu. Meanwhile, Bharata returned to Ayodhya and, being also devoted to Rama, became furious with Kaikeyi for her role in exiling Rama and for the death of his father. Determined to bring back Rama, he headed for the forest. When he found Rama and pleaded with him to return and assume the throne, Rama politely refused, saying that he was duty-bound to see that his father's promise was fulfilled. Reluctantly Bharata agreed to return to the kingdom, requesting that Rama give to him his sandals. Back in Ayodhya, Baratha placed Rama's sandals on the throne of Ayodhya, and ruled as Rama's proxy from a village called Nandigrama near Ayodhya, awaiting his return. He also vowed to end his own life if Rama failed to return after 14 years. One day, the demoness Surpanakha, a sister of the demon king Ravana, chanced upon Rama's hermitage and saw the handsome Rama and became enamored. Taking the form of a beautiful young girl, she tried to seduce Rama. Rama, ever faithful to his wife Sita, did not respond and asked her to approach Lakshmana. Lakshmana too refused, stating his duty towards his brother and his sister-in-law while in exile. An infuriated Surpanakha blamed Sita to be the reason for her being scorned and charged at her in her original form. But Lakshmana, saved Sita by severing Surpanakha's nose and ears. Surpanakha flew back to Ravana complaining. Ravana, after hearing of the beautiful Sita from Surpanakha, resolved to kill Rama in revenge and take Sita for himself. With the help of the demon Maricha Ravana lured Rama and Lakshmana away from the hermitage, leaving Sita alone. Before leaving Lakshmana drew a circle in the dirt saying that Sita would be safe as long as she stayed in the circle. Ravana approached the hermitage in the guise of an old man and asked Sita to give him some food. Initially hesitant to step out of Lakshmana's circle, Sita finally stepped out to give the old man some food. At this moment Ravana grabbed Sita and fled in his airborne vehicle, (Pushpaka Vimana). Jatayu, seeing them fly, attempted to save Sita, but Ravana engaged Jatayu in combat and chopped off the vulture's wings. On returning to the hermitage, Rama and Lakshmana found it empty and anxiously began a search. Through Jatayu, whom they found lying mortally wounded, Rama and Lakshmana learnt of Sita's fate. Continuing their search, they encountered the monkey king of Kishkindha, Sugriva, and Hanuman, one of his generals, among whom Sita had dropped from the chariot her scarf and some ornaments. Sugriva had been deposed from his kingdom by his brother, Vali, who had also taken his wife Roma from him. Rama agreed to defeat Vali if Sugriva would assist in the search for Sita. The agreement made, Sugriva challenged Vali to a duel. 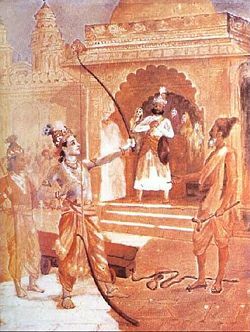 While the duel was progressing, Rama shot from his bow and killed Vali. Sugriva regained his kingdom and his wife. Sugriva and Rama sent the monkey soldiers in various directions in search of Sita. However their efforts didn't bear fruit until they met another ancient vulture, Sampati, who was the brother of the slain Jatayu. Sampati was earthbound and deformed - his wings were burnt when he flew too close to the Sun (a story that can be considered to be the inspiration to that of Icarus's). His brother, being hardier, had saved him from falling to his death. While Jatayu was the physically stronger of the two, Sampati possessed a compensating gift of vision. Sampati's vision was incredibly powerful, spanning several hundred yojanas and enabling him to see farther than anyone else. On hearing of Ravana's killing his brother, he readily agreed to help the monkeys. He was soon able to spot Sita in the southern direction. He could see her imprisoned in a garden of Ashoka trees on the island of Lanka, beyond the southern ocean. Sugriva dispatched his monkey army to the south with his nephew Angad at the head. Hanuman went with Angad as his general. Whey they reached deep south, they found a great ocean stretching between them and land of Lanka. They could find no means by which to cross the ocean. Commanding his soldiers to remain where they were, Hanuman expanded his body to enormous proportions, leaped the vast expanse of water, and alighted upon a mountain Trikuta from which he could look down upon Lanka. Perceiving the city to be closely guarded, he assumed the form of a cat, and thus, unsuspected, crept through the barriers and examined the city. He found Ravana in his apartments, surrounded by beautiful women, but Sita was not among them. Continuing his search, he at last discovered her, her beauty dimmed by grief, seated under a tree in a beautiful asoka grove, guarded by hideous rakshasas with the faces of buffaloes, dogs, and swine. Assuming the form of a tiny monkey, Hanuman crept down the tree, and giving her the ring of Rama, took one from her. He offered to carry her away with him, but Sita declared that Rama must himself come to her rescue, and as proof of finding her Sita gave Hanuman a priceless jewel to take back to Rama. While they were talking together, Ravana appeared, and, after fruitless wooing, announced that if Sita did not yield herself to him in two months he would have her guards "mince her limbs with steel" for his morning repast. In his rage, Hanuman destroyed a mango grove and was captured by the rakshasa guards, and brought before Ravana. Hanuman proclaimed that he was a messenger of Rama, and demanded that Ravana restore Sita to Rama or fall victim to Rama's wrath. Furious at hearing Hanuman's words, Ravana ordered Hanuman's death. Vibhishana, Ravana's righteous brother, intervened and counseled Ravana to follow the scriptures, reminding that it was improper to execute a messenger, and instead told him to exact the appropriate punishment for Hanuman's crime. Ravana accepted and ordered his rakshasas to set fire to Hanuman's tail. As soon as this was done, Hanuman made himself very small, slipped from his bonds, and, jumping upon the roofs, spread a conflagration through the city of Lanka. He leaped back to the mainland, conveyed the news of Sita's captivity to Rama and Sugriva, and was soon engaged in active preparations for the campaign. Rama decided that as long as the ocean was not bridged, it was impossible for any one but Hanuman to cross it. Rama meditated for three days, but in vain. In his anger at being so ignored, Rama turned his weapons against the ocean, until from the terrified waves arose Varuna, the god of the ocean, who promised him that if he built a bridge, the waves should support the materials as firmly as though it were built on land. Terror reigned in Lanka at the news of the approach of Rama. Vibishana, Ravana's brother, deserted to Rama, because of the demon's rage when he advised him to make peace with Rama. Fiercely fought battles ensued, in which even the gods took part—Vishnu and Indra taking sides with Rama, and the evil spirits fighting with Ravana. After the war had been fought for some time, with varying results, and a great number of troops on both sides were killed, it was decided to determine the victor by single combat between Ravana and Rama. Even the gods were terrified at the fierceness of the conflict. At each shot Rama's mighty bow cut off a head of Ravana, which at once grew back, and the hero was in despair until Vibishana told him to aim at Ravana's belly-button. Rama took careful aim. As Ravana fell by this weapon, flowers rained from heaven upon the happy victor, and his ears were ravished with celestial music. Touched by the grief of Ravana's widow, Mandodari, Rama ordered a splendid funeral for his foe, and then sought the conquered city. Sita was led forth, beaming with happiness at finding herself re-united to her husband; but her happiness was destined to be of short duration. Rama received her with coldness and with downcast eyes, saying that she could no longer be his wife, after having dwelt in the house of Ravana. Sita assured him of her innocence; but on his continuing to revile her, she ordered her funeral pyre to be built, since she would rather die by fire than live despised by Rama. The sympathy of all the bystanders was with Sita, but Rama saw her enter the flames without a tremor. Soon Agni, the god of fire, appeared, bearing the uninjured Sita in his arms. Her innocence thus publicly proved by the trial by fire, she was welcomed by Rama, whose treatment she tenderly forgave. The conquest won, Ravana defeated, and Sita restored, Rama returned in triumph to Ayodhya, and assumed the governance to the great delight of Bharata and the people of Ayodhya. Ayodhya was prosperous, the people were happy, and for a time all went well. It was not long, however, before whispers concerning Sita's long stay in Lanka spread through the city, and Rama came to hear the gossip that a famine in the country was due to the guilt of Sita, who had suffered the caresses of Ravana while in captivity. Under the pressure from the citizens of Ayodhya, Rama banished her to the forest in which they had spent together the happy years of their exile. Without a murmur the unhappy Sita dragged herself to the forest, and, torn with grief of body and spirit, found the hermitage of Valmiki, where she gave birth to twin sons, Lava and Kuça. Here she reared them, with the assistance of the hermit, who was their teacher, and under whose care they grew to manhood, handsome and strong. It chanced that about the time the youths were twenty years old, Rama began to think the gods were angered with him because he had killed Ravana, who was the son of a Brahmin. Rama became determined to propitiate them by means of Ashvamedha, the great sacrifice, in which he caused a horse to be turned loose in the forest. When his men went to retake it, at the end of the year, they found it caught by two strong and beautiful youths who resisted all efforts to capture them. When his men could not retake the horse, Rama went to the forest in person, only to learn that the youths were his twin sons, Lava and Kuça. Struck with remorse, Rama recalled the sufferings of his wife Sita, and on learning that she was at the hermitage of Valmiki, requested her to come with him. Sita had had time to recover from the love of her youth, and the prospect of life with Rama, she felt, was not altogether pleasant. She appealed to the earth, if she had never loved any man but Rama, if her truth and purity were known to the earth, let it open its bosom and swallow her whole. While the people stood trembling with horror, the earth opened, a gorgeous throne appeared, and the goddess of earth, seated upon it, took Sita beside her and conveyed her to the realms of eternal happiness, leaving the too late repentant people to wear out the remaining years in penitence. In his Ramayana, Valmiki expresses his view of human code of conduct through Rama. He thus adopts the view that Dharma is what is proclaimed in the Veda and it should be followed for its own sake, not for what it brings you in pain or pleasure. Doing this will ensure one's welfare in this and the next world. In addition, the Ramayana also reinforces the need for thinking about the consequences before making promises, for if you make them you must keep them, no matter how hard it may be. Sankshepa Ramayana, the brief narration of the entire Ramayana story by the sage Narada to Valmiki, forms the first sarga of Valmiki Ramayana. Narada lists the sixteen qualities of the ideal man and says that Rama was the complete man possessing all sixteen of these qualities. Although Rama himself declares "he is but a man, and never once claims to be divine,  Rama is regarded by Hindus as one of the most important Avatars of the god Vishnu and as an ideal man. Valmiki portrays Rama not as a supernatural being, but as a human with all the attendant shortcomings, who encounters moral dilemmas but who overcomes these by simply adhering to the dharma—the righteous way. There are several instances narrated in Valmiki Ramayana which cast shadows on the pristine character of the hero. When Rama killed Vali to aid Sugriva regain his throne, it was not in fair combat, but while hiding behind a tree. When Sita was freed from Ravana's prison, Rama forced Sita to undergo an ordeal by fire to prove her purity and later as the king, Rama killed the Shudra Shambuka for performing a yogic penance not in keeping with his perceived low station in the society. These and many more instances within Ramayana illustrate the very human nature of the hero Rama help to reinforce the basic moral behind the story that men do not have to be supernatural to be righteous. Traditionally the epic belongs to the Treta Yuga, one of the four eons of Hindu chronology and is attributed to Valmiki, an active participant in the story. It is composed in Epic Sanskrit, an early variant of Classical Sanskrit, so that in principle the core of the work may date to as early as the fifth century B.C.E.. After hundreds of years of transmission, the epic has gone thorough numerous variations and thus cannot be dated by linguistic analysis as a whole. It should be considered to have emerged over a long process, spanning maybe from the fifth century B.C.E. to the fourth century C.E. There is general consensus that books two to six comprise the oldest portion of the epic while the first book (Bala Kanda) and the last (the Uttara Kanda) are later additions. The author or authors of Bala Kanda and Ayodhya Kanda appear to be familiar with the eastern Indo-Gangetic basin region of northern India and the Kosala and Magadha region during the period of the sixteen janapadas as the geographical and geopolitical data is in keeping with what is known about the region. However when the story moves to the Aranya Kanda and beyond, it seems to turn abruptly into fantasy with its demon-slaying hero and fantastic creatures. The geography of central and south India is increasingly vaguely described. The knowledge of the location of the island of Lanka also lacks detail. Basing his assumption on these features, the historian H.D. Sankalia has proposed a date of the fourth century B.C.E. for the composition of the text. A. L. Basham, however, is of the opinion that Rama may have been a minor chief who lived in the eighth or the seventh century B.C.E. The events of the epic have also been dated to as early as 6000 B.C.E. by adherents of archaeoastronomy. As in many oral epics, multiple versions of the Ramayana survive. In particular, the Ramayana related in north India differs in important respects from that preserved in South India and the rest of South-East Asia. There is an extensive tradition of oral storytelling based on the Ramayana in Thailand, Cambodia, Malayasia, Laos, Vietnam, and Indonesia. In many Malay versions, Lakshmana is given greater importance than Rama, whose character is considered somewhat weak. There are diverse regional versions of the Ramayana written by various authors in India. Some of them differ significantly from each other. During the twelfth century C.E., Kamban wrote Ramavatharam, known popularly as Kambaramayanam in Tamil. Although based on the Valmiki Ramayana, Kambaramayanam is unique in that Kamban has modified and reinterpreted many anecdotes in Valmiki Ramayana to suit the Tamil culture and his own ideas. Valmiki's Ramayana also inspired the Sri Ramacharit Manas by Tulasidas in 1576, an epic Awadhi (a dialect of Hindi) version with a slant more grounded in a different realm of Hindu literature, that of bhakti. It is an acknowledged masterpiece of India. It is popularly known as "Tulsi-krita Ramayana." Gujarati poet Premanand wrote a version of Ramayana in the seventeenth century. Other versions include, a Bengali version by Krittivas in the fourteenth century, in Oriya by Balarama Das in the sixteenth century, in Marathi by Sridhara in the eighteenth century, a Telugu version by Ranganatha in the fifteenth century, a Kannada Ramayana by the sixteenth century poet Narahari, Kotha Ramayana in Assamese by the fourteenth century poet Madhava Kandali and Adhyathma Ramayanam Kilippattu, a Malayalam version by Thunchaththu Ezhuthachan in the sixteenth century. There is a sub-plot to the Ramayana, prevalent in some parts of India, that relates to the adventures of Ahi Ravana and Mahi Ravana, the evil brother of Ravana, which enhances the role of Hanuman in the story. Hanuman rescues Rama and Lakshmana after they are kidnapped by the Ahi-mahi Ravana at the behest of Ravana and held prisoner in a subterranean cave, ready to be sacrificed to the goddess Kali. There have been reports of a version of the Ramayana story prevalent amongst the Mappilas of Kerala. This version, known as Mappila Ramayana, forms a part of the Mappillapattu. Mappillapattu is a genre of folk singing popular among the Muslims of Kerala and Lakshadweep. Being of Muslim origin, the hero of this story is a sultan. There are no major changes in the names of characters except for that of Rama's which is changed to 'Laman'. The language and the imagery projected in the Mappilapattu are in accordance with the social fabric of the earlier Muslim community. Many other Asian cultures have adapted the Ramayana, resulting in other national epics. Aspects of the Chinese epic Journey to the West were inspired by the Ramayana, particularly the character Sun Wukong, who is believed to have been based on Hanuman. Kakawin Rāmâyaṇa is an old Javanese rendering of the Sanskrit Ramayana from the ninth century Indonesia. It is a faithful rendering of the Hindu epic with very little variation. Phra Lak Phra Lam is a Lao language version, whose title comes from Lakshmana and Rama. The story of Lakshmana and Rama is told as the previous life of the Buddha. In Hikayat Seri Rama of Malaysia, Dasharatha is the great-grandson of the Prophet Adam. Ravana receives boons from Allah instead of Brahma. Thailand's popular national epic Ramakien is derived from the Hindu epic. In Ramakien, Sita is the daughter of Ravana and Mandodari (T'os'akanth (=Dasakand) and Mont'o). Vibhisana (P'ip'ek), the astrologer brother of Ravana, predicts calamity from the horoscope of Sita. So Ravana has her thrown into the waters, who, later, is picked by Janaka (Janok). While the main story is identical to that of the Ramayana, many other aspects were transposed into a Thai context, such as the clothes, weapons, topography, and elements of nature, which are described as being Thai in style. It has an expanded role for Hanuman and he is portrayed as a lascivious character. Ramakien can be seen in an elaborate illustration at the Wat Phra Kaew temple in Bangkok. Other Southeast Asian adaptations include Ramakavaca of Bali, Maradia Lawana of the Philippines, the Reamker of Cambodia and the Yama Zatdaw of Myanmar. Contemporary versions of the Ramayana include Shri Ramayana Darshanam by Dr. K. V. Puttappa (Kuvempu) in Kannada and Ramayana Kalpavrikshamu by Viswanatha Satyanarayana in Telugu, both of which have been awarded the Jnanpith Award. The modern Indian author Ashok Banker has so far written a series of six English language novels based on the Ramayana. Amongst the ruins of the Vijayanagara empire near Hampi, is a cave known as Sugriva's Cave. The cave is marked by coloured markings. The place holds its similarity to the descriptions of 'kishkinda' in Sundarakanda. Rama is said to have met Hanuman here. The place is also home to the famous Hazararama temple (Temple of a thousand Ramas). ↑ Note that the cerebral ṇ is due to infection by the word-initial r, see sandhi. ↑ About 480,000 words, or a quarter of the length of the full text of the Mahabharata, or about four times the length of the Iliad. ↑ Robert P. Goldman, The Ramayana of Valmiki: An Epic of Ancient India (Princeton University Press, 1999, ISBN 069101485X), 23. ↑ 5.0 5.1 N. Raghunathan (trans. ), Srimad Valmiki Ramayana (Madras: Vighneswara Publishing House, 1981). ↑ In the Vedas Sita means furrow, relating to a goddess of agriculture. - S.S.N. Murty, [https://www.scribd.com/document/82104686/A-Note-on-the-Ramayana-S-S-N-Murthy "A note on the Ramayana" (New Delhi: Jawaharlal Nehru University). Retrieved January 23, 2018. ↑ H.D. Sankalia, Ramayana: Myth or Reality. (New Delhi, 1963). ↑ A.L. Basham, The Wonder that was India: A Survey of the Culture of the Indian Sub-continent Before the Coming of the Muslims. (original 1856; London, 1956) ACLS History E-Book Project, 1999), 303. ↑ "A different song," The Hindu, August 12, 2005. Retrieved January 23, 2018. ↑ See Gauri Mahulikar, Effect Of Ramayana On Various Cultures And Civilisations. Retrieved January 19, 2018. Mahulikar, Gauri. Effect Of Ramayana On Various Cultures And Civilisations. Retrieved January 19, 2018. Milner Rabb, Kate, National Epics. Retrieved January 19, 2018. Murthy, S. S. N. "A note on the Ramayana," Jawaharlal Nehru University, New Delhi. Retrieved January 19, 2018. Raghunathan, N. (Trans), Srimad Valmiki Ramayanam, Vighneswara Publishing House, Madras, 1981. "A different Song" - Article from The Hindu, August 12, 2005. Retrieved January 12, 2018. Sankalia, H.D. Ramayana: Myth or Reality. New Delhi, 1963. Valmiki Ramayana translated by Ralph T. H. Griffith (1870-1874).www.sacred-texts.com. The Rámáyan of Válmíki, translated into English verse by Valmiki Gutenberg.org. The Book of good counsels, Nala and Damayanti Gutenberg.org. This page was last modified on 23 January 2018, at 20:33.